ellehermansen: Hipp Hipp Hurra for Syttende Mai! Ohhh I LOVE this picture!!! Edie is so cute :=) And I love the clothes, so beautiful, tante Inger is so clever! Tante Inger did such an awesome job! A true Norwegian talent :) I can't wait to visit Norway again real soon! Edie looks so comfortable all dressed to the nines. She's a future fashionista! 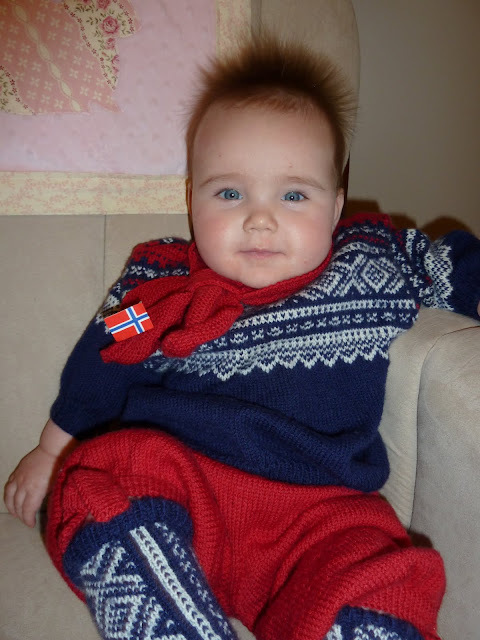 Bahhhh I love her in the Norwegian getup! Adorable.